One morning in late August, Toby Wolf took a walk around Boston Common with plant and soil scientist Normand Helie. With Boston undergoing extreme drought and the Common’s lawns a patchwork of brown and green, they discussed the ways that grass adapts to changes in its environment and some ways that responsive maintenance can support rather than override those adaptations. Toby's walk with Norm resulted in a short article that outlines six sustainable practices that can help urban lawns adapt to drought. Many thanks to Norm for his insights, and to the Friends of the Public Garden for publishing the article in their newsletter and their blog. Did the Big Dig deliver? “The greatest success of the Big Dig is this: It established a new landscape for the city to flourish around. Buildings once overlooking a clogged highway now have a beautiful park at their front door. Buildings that had little value are now suddenly on a gold coast." We've had the privilege of working on the Big Dig and the Greenway for nearly twenty years. Under various affiliations, Toby Wolf designed the Greenway’s Fort Point Channel Parks, Urban Arboretum, and Dewey Square Park, and over a mile of its streetscapes. Even when the project ended, his work continued, through Wolf Landscape Architecture's recent designs for new plantings on behalf of the Rose Kennedy Greenway Conservancy. Ten years on, thanks to their innovative management, the Greenway continues to deliver. Work is complete on the third phase of the renovation of the Boylston Street Border in Boston's Public Garden. Three quarters of the border's 900-foot length now benefits from improved drainage, reinvigorated plantings, and inviting places to sit. The project's phased implementation has allowed our team to improve each year on the work that came before. This year we fine-tuned the planting palette, adjusted the soil mix, revised the transplant specifications, improved the way benches are installed, and eased curb installation by providing the granite quarry with full-size templates. These changes helped achieve an improved outcome at no additional cost. Construction of Phase 4 will begin in September 2016. To see project updates, to become a member, or to learn how to sponsor a bench or a tree, please visit the Friends of the Public Garden online. On April 13, Toby Wolf will join Cornell's University Planner Leslie Schill, University Landscape Architect David Cutter, and lecturer Michele Palmer to present Cornell's green infrastructure initiatives at the North Atlantic Regional Conference of the Society for College and University Planning. We hope you'll join us in Providence for our panel "Site, Campus, Watershed: Integrating Green Infrastructure in Sustainability Planning." Learn more about SCUP and its regional conference here. A new study published by the Landscape Architecture Foundation affirms key environmental and educational impacts of the Bioswale at Cornell Plantations in Ithaca, New York. Built in concert with the Nevin Welcome Center and located at its visitor parking lot, the Bioswale greets visitors to Cornell's botanical garden with a bold display of plants—and it soaks up stormwater. Unlike conventional landscapes, which put runoff into drains and pipes, high-performance landscapes like the Bioswale help to restore natural water cycles using plants and soils. They cleanse and cool the runoff that flows from roofs and pavement, recharging local aquifers and protecting natural waterways from pollution, flooding, and erosion. In the LAF study, Cornell researchers Michele Palmer and Mujahid Powell found that the bioswale is reducing runoff by 31% (78,000 gallons annually), cutting peak flows in major storms by 81%, improving soil health, increasing biodiversity, and galvanizing support for green infrastructure among the fifty thousand people who visit Cornell Plantations each year. Toby Wolf authored the Botanical Garden's master plan and served as landscape architect for the Welcome Center and Bioswale while a Senior Associate at Halvorson Design Partnership, working in collaboration with landscape designer Irene Lekstutis, architects Baird Sampson Neuert, and civil engineers TG Miller. The Welcome Center and the Bioswale have earned LEED Gold certification, and the Bioswale has been recognized by the Society for College and University Planning with its Honor Award for Excellence in Landscape Architecture. 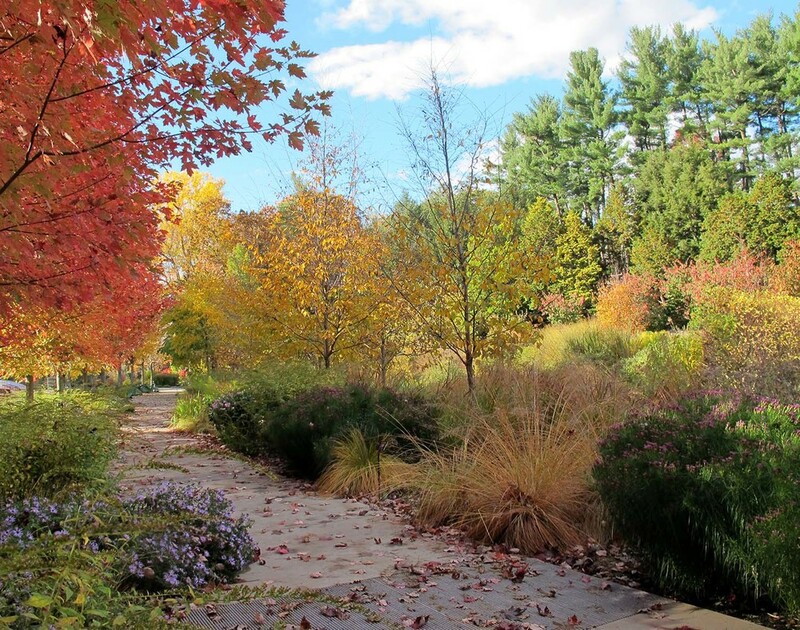 Dr. Christopher Dunn, the E. N. Wilds director of Cornell Plantations, has called the Bioswale "one of the premier gardens of its kind, inspiring other botanic gardens to create similar landscapes." Find out more about the LAF study here, and about Cornell Plantations' Bioswale here. Schematic designs are complete for a pop-up park at the future site of Constellation Center in Cambridge's Kendall Square. The new public space will bring lawns, seating, and color to the fast-growing neighborhood, and will provide Pablo Eduardo's sculpture Las Furias with a new setting of rolling landforms, reclaimed granite, and native plants. On November 12, the Trustees of Reservations hosted the Ecological Landscape Alliance's annual Season's End Summit at Castle Hill on the Crane Estate in Ipswich, Massachusetts. The program went from strength to strength, with lectures by Tom Benjamin, Laura Kuhn, Ann Kearsley, and Lucinda Brockway as well as a panel discussion with Theresa Sprague, Miles Connors, and Michele Grzenda. But there's nothing like seeing the real thing. So after lunch, while the morning's fog burned off, the Trustees' Operations Manager Bob Murray led a tour of Castle Hill's landscape and showed us how sustainable design is supporting historic restoration. Find out more about the Trustees' work at Castle Hill here. The second phase of our renovation of the Boylston Street Border in Boston's Public Garden is nearly complete. Working with landscape architect Deb Howe, arborist Norm Helie, and civil engineer John Cusack, we have moved and planted trees and shrubs, improved drainage, and made space for two more benches. In the weeks ahead we'll add more perennials and bulbs, and the last tree will be planted early next spring. The multi-year rejuvenation of the entire 900 foot length of the the Border is a project of the Friends of the Public Garden, who have posted a project update here. The Friends work in partnership with Boston's Parks Department to care for the Garden, the Common, and the Commonwealth Avenue Mall, and membership is open to all.